It’s a 9-game slate in the National Hockey League tonight as several trade deadline acquisitions are set to make their first appearances with their new teams. With so many ups and downs over a long season, maintaining your confidence as a handicapper is one of the most difficult things about hockey betting. 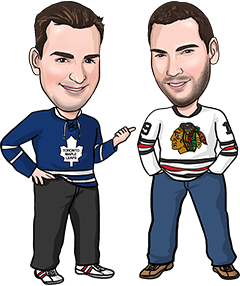 After going 1-3 Saturday and splitting a pair of Sunday bets, we second-guessed ourselves a bit too much yesterday and passed up what would have been a nice winner on the Maple Leafs First Period Moneyline +132. It was a good reminder to just trust your numbers and instincts and let the chips fall where they may, win or lose. We’re doing exactly that with our 3 bets for tonight, and hopefully we can close out a strong February in style. A few other games nearly made the cut as well. We initially were going to bet Hurricanes/Bruins Under 5.5, but quickly changed our minds once Scott Darling was announced as the Carolina starter. You never know what you’re going to get with him, and the Bruins lit him up the last time he played in Boston. The Devils Team Total Under and the Golden Knights -0.5 first period puck line are the other leans we feel strongest about today. New Jersey’s been struggling a bit offensively and the Pens might focus a bit more on protecting young netminder Jake DeSmith (especially after Pittsburgh allowed 6 goals Saturday in Florida), while the Knights have been tremendous in first periods at home all year and the Kings are known for getting off to slow starts. Good luck on whatever you decide to play tonight! Reasons to bet Toronto: The Leafs are 13-2-1 in their last 16 games. Florida has allowed 3+ goals in 6 of its last 8 games. Reasons to bet Florida: The Panthers have won 5 of their last 7 games and 9 of 12. Toronto is playing for the second straight night and 3rd in 4, while the Panthers have been off since Saturday. Reasons to bet St. Louis: The Blues have outshot the Wild 119-70 in 3 meetings this season. Minnesota is playing its 4th game in 6 days. Reasons to bet Minnesota: The Wild is 21-5-6 at home this season and is 7-1-2 in its last 10 overall. St. Louis has lost 6 straight, scoring just 7 goals during that span. Reasons to bet Calgary: The Flames are 18-8-5 on the road and have scored 3+ goals in 8 of their last 10 games overall. Dallas has lost 4 of 6, allowing 5+ goals 3 times during that skid. Reasons to bet Dallas: The Stars are 21-10-1 at home and have beaten Calgary twice already this season, winning 6-4 Nov. 24 in Dallas and 2-1 Oct. 27 in Calgary. Reasons to bet Carolina: The Hurricanes look to avenge the 7-1 loss they suffered in their last visit to Boston on Jan. 6. Boston is playing its first home game following a 5-game road trip and is without Bergeron. Reasons to bet Boston: The Bruins should be motivated to get back on track after falling 4-1 Sunday in Buffalo, Boston’s third loss in 5 games. Carolina has lost 5 straight, scoring just 6 goals during that span. Reasons to bet Ottawa: The Senators have scored 3+ goals in 9 of their last 10 games. Washington lost 5-1 last night in Columbus, its 4th defeat in its last 6 games and 6th in 9. Reasons to bet Washington: The Capitals have won 7 of the last 8 meetings, including a pair of wins earlier this season. Ottawa has allowed 19 regulation time goals in its last 4 road games. Reasons to bet New Jersey: The Devils have won 5 of their last 7 games and are 15-10-5 on the road. New Jersey outshot the Penguins 38-16 in a 3-1 win over Pittsburgh Feb. 3 in New Jersey. Reasons to bet Pittsburgh: The Penguins have won 10 straight at home, where they are 23-7-1 on the year. New Jersey has lost 14 of its last 17 visits to Pittsburgh. Reasons to bet Nashville: The Predators have won 4 straight and are 6-2-2 in their last 10. Winnipeg has cooled off a bit at home, going 3-3 in its last 6 after going 20-4-1 in its first 25. Reasons to bet Winnipeg: The Jets have won 5 of 6 overall, averaging nearly 5 goals per game during that stretch. Reasons to bet Los Angeles: The Kings are 19-13-2 on the road and could have momentum from their comeback OT win over Vegas last night in LA. The Golden Knights have allowed 3+ goals in 4 of their last 5 games and 7 of 10. Reasons to bet Vegas: The Golden Knights are 24-5-2 at home. Though both teams are playing for the second straight night, LA is also playing its 3rd in 4, 4th in 6 and 6th in 9. Reasons to bet Edmonton: The Oilers have won 4 of their last 5 games and recorded 40+ shots in 4 of 6. San Jose has scored just 7 goals in its last 4 games and is playing its first home game in 9 days. Reasons to bet San Jose: The Sharks are 17-9-3 at home, where they’ve scored 19 goals in their last 4 games. Edmonton has allowed 3+ goals in 7 of its last 10.